Power BI lets you create personalized dashboards and reports to monitor the key metrics of your business, at-a-glance. 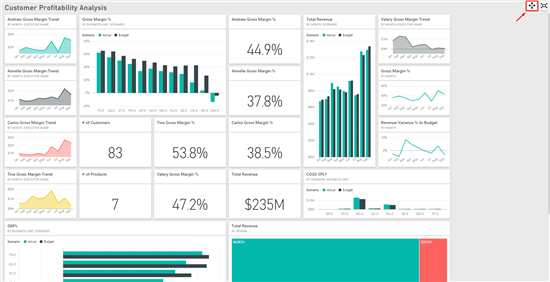 All you needed to do was to fire up your browser and navigate to your Power BI dashboard. Today we’re making this even better. 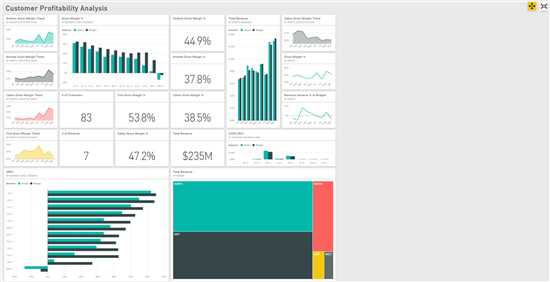 With today’s update, we have enabled Full Screen Mode for Power BI dashboards and reports. What does this mean for you? If you have big screen TVs or projectors in your office, you can display Power BI dashboards and reports on those screens without the distraction of menus, buttons etc. You get an unadulterated, full view of your business at a glance, all the time. This mode is also very useful when you are presenting your dashboards and reports. You can have discussions on the metrics and the charts without being cluttered by the different menu elements. You can activate this mode with a single click. Navigate to your dashboard and press the “Full Screen Mode” button on the top right. You will see the surrounding menu and application elements disappear and your dashboards will take up your full screen space. To go back to the standard viewing mode, click the full screen button on the top right again. You also do not need to worry about accidentally moving around tiles or editing them in the middle of a presentation – Full Screen Mode prevents you from editing/moving tiles. In the previous image, you can see that the bar chart and the tree map at the bottom of the dashboard get cut off because of the lack of screen space. You would need to scroll to see the rest of the dashboard. This can be especially problematic for dashboards that are larger than the browser window. You can now use the ‘Fit to screen’ option that is available in Full Screen Mode to see your full dashboard in the available space. To use this feature, activate your Full Screen Mode and press the ‘Fit to screen’ button on the top right. Power BI will automatically scale the tiles to fit your entire dashboard in the available screen space. This mode lets you see a particular tile in full focus. The additional space will be used to show more information when possible. 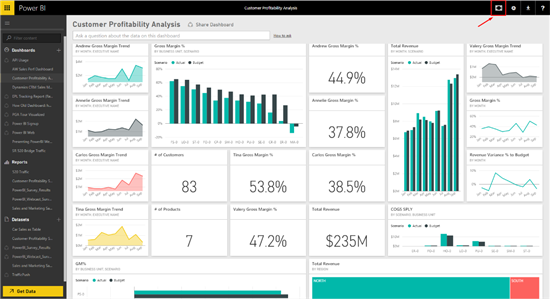 For an example of how you would use this functionality, take a look at the dashboard below. We have a dashboard showing the Gross Margins trends of different executives among other things. Lets’ see how In-focus mode will help us to investigate Tina’s Gross Margin Trend tile. We start by hovering over the tile and clicking on the In-focus mode icon. 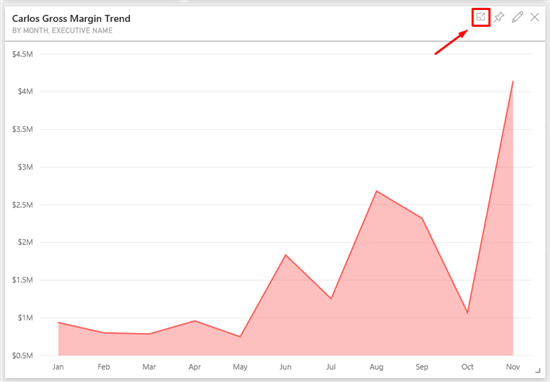 We can now see Tina’s Gross Margin trend in a full screen view. 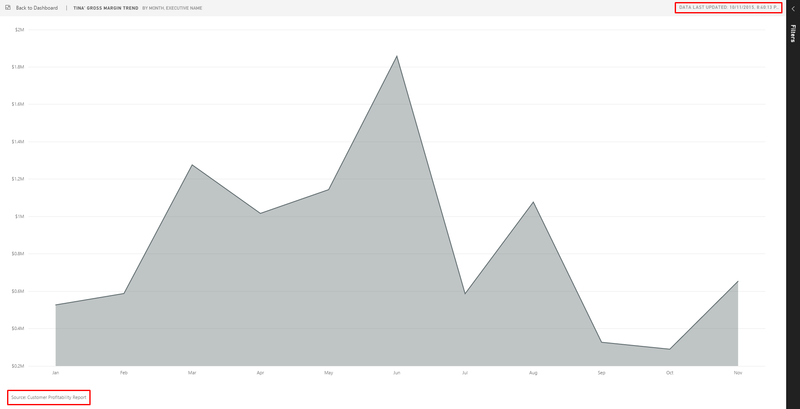 The Y-axis is much more granular in In-Focus mode than in the actual dashboard tile. Now let’s see how Tina did last year. In In-Focus mode, we can pull open the Filters area to see all the filters applied on the dashboard tile when it was created. Lets’ change the filter on the year column to see how Tina did in 2013. We can see that she had a pretty good year in 2013. Note: Currently In-Focus mode is not available for tiles pinned from Q&A and map tiles. We’ve also added the last update time for the underlying tile data. This makes easy to identify how recently the data was updated for the specific data displayed in this tile. To see this, open your tile in In-Focus mode and look at the top right. The last updated time is visible there. 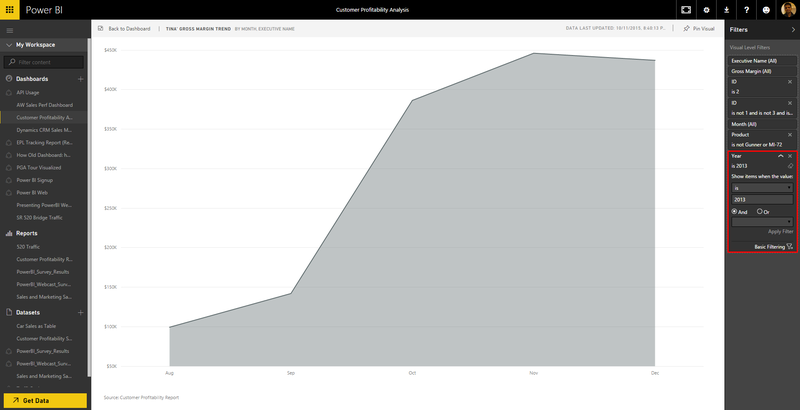 From the bottom left of the In-Focus mode of your tile, you can also see that the Customer Profitability Report is the source for this visual. You can also simply click on this information and you will navigate to the specific report page. Hope you like the new features that we released today. Try out the features and let us know what you think!